London’s famous Chelsea Pensioners live at the Royal Hospital Chelsea, which was founded by King Charles II in 1682 as a home for soldiers unfit for further duty because of injury or old age. Instantly recognisable in their vibrant red coats, Chelsea Pensioners are encouraged to wear what are known as their “scarlets”, accompanied by tricorne hats, when representing the Royal Hospital on an official visit or on parade. Otherwise, within a two-mile radius of the Royal Hospital, their “blues” are worn on a daily basis, with shako caps embroidered with the letters RH, the initials of the Royal Hospital. Today some 300 pensioners – all retired soldiers of the British Army – reside at the Christopher Wren-designed hospital, which offers accommodation and companionship to soldiers over the age of 65 who are facing old age alone. “If you get lost in London, ask a policeman,” children are still told. The capital’s iconic “bobbies” got their name from Sir Robert Peel, the home secretary who introduced the Metropolitan Police Act in 1829. Strange to think that London didn’t have a professional police force before then – more of a jumble of night watchmen, local constables and red-coat-wearing soldiers. As a break from the resented red coats, Peel’s police wore dark blue tailcoats and top hats, the former representing servitude, as public servants, the latter to represent authority. They were armed only with a truncheon, handcuffs and a wooden rattle to raise the alarm, which had been replaced by a whistle by the 1880s. Peel’s constables, also known as “peelers”, became the model for the creation of all the provincial forces – first in the London boroughs and then throughout the UK after the passing of the County Police Act in 1839. Indeed, Peel’s system was such a success that by the mid-19th century large cities in the US had created similar police forces. Yeoman Warders, as Beefeaters are officially known, stand guard and give tours at the Tower of London. The famous nickname is thought to have come from their position in the Royal Bodyguard, which meant they could eat as much beef as they wanted from the king’s table. A detachment of the Yeomen of the Guard, Beefeaters have formed the Royal Bodyguard since at least 1509 and are required to have served in the armed forces for at least 22 years with an honourable record. 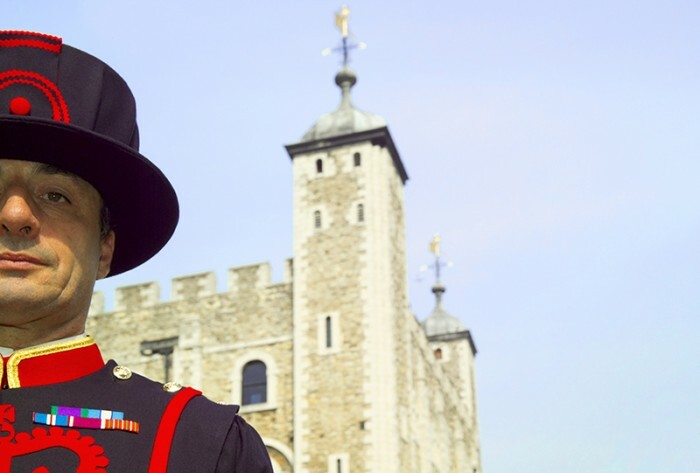 Today’s well-behaved and salaried yeomen warders are knowledgeable guides – a far cry from those at the Tower in 1598 who caused Sir John Peyton, the Lieutenant of the Tower, to complain some were “given to drunkenness, disorders and quarrels”. Representing the irrepressible cockney spirit, Pearly Kings and Queens were founded in the 19th century by Henry Croft, a road-sweeper and rat-catcher who was a lifelong friend of the costermongers, a close-knit group of market traders. The costermongers used to decorate their clothes with rows of pearl buttons but Croft took the habit to a new level, covering a worn-out dress suit and top hat completely with pearl buttons he swept from the street. In doing so, he raised a significant amount of money for charity, particularly the orphanage where he grew up, and soon he needed help. He approached the costermongers for assistance and these became the first Pearly Families: one for each borough of London, one for the City of London, and one for the City of Westminster. Today, the succession of Pearlies is by inheritance and the Pearlies have a special relationship with St Martin-in-the-Fields, where you can see a statue of Henry Croft in the crypt.